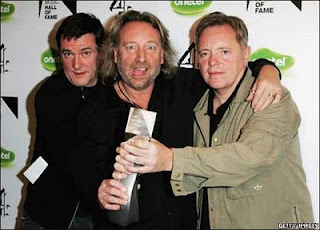 Bernard Sumner Says New Order Mate Peter Hook "Needs to Chill Out"
Last week New Order bassist Peter Hook shocked fans by lashing out at his bandmates on his blog and announcing the group had broken up: "You are no more new order than i am! You may have two thirds but dont assume you have the rights to do anything NEW ordery cos you dont ive still got a third!" New Order guitarist Bernard Sumner - who hasn't seen Hook since the group toured South America last November (NOOL Editorial Note: Not true, they were in Cannes at the premiere of Control) - was as surprised as anyone who read the post. "I find it very distasteful for him to do that after all this time," he says, checking in by telephone from England. "He should have had a meeting with us. I'm not having someone tell me that we've split up without consulting me first. I think that's very arrogant." Sumner is unsure whether he and drummer Stephen Morris will continue on as New Order without Hook. "We haven't got any plans to make any music under the guise as New Order," Sumner says. "I've working on two other projects at the moment so I'm kind of busy for the next couple of years anyway." And Hook, he says, needs to take five: "I think that Hooky just needs to chill out a little bit and relax." Sumner says he has no plans to reach out to his blogging bandmate to clear everything up. "He's the guy who with the problem, so he should approach us," he says. "We haven't got a problem. I just don't think he likes me, so what can you do?"